How about "The Edge of Steel and Sorcery"? I finally went outside the box a bit, stepping away from the original title and went with one that I think works really well. It's one of Ewzad's titles. He has a major role on book two and it fits. Here is the revised cover. And thank you for the review. Do you know where you found the errors? If you wanted to PM me, that is something that can be fixed. In fact it may have already been fixed with the current version depending on how long ago it was that you downloaded it. They may have been fixed already. I can't remember any specifics, unfortunately...but that's a good thing, since it means if I'm remembering more story than punctuation issues, they can't have been that bad. I wasn't bookmarking pages when I saw them, and I do know the biggest formatting issues were the result of the Kindle app and nothing to do with the manuscript itself. The app did get weird a couple of times, too...sometimes it would display paragraphs in a completely different font than the one before it, and sometimes paragraphs were underlined. I did mean what I said about Fist, though...I truly thought his story was one of the highlights of the book. I know Berkley Breathed said when he introduced Opus into Bloom County, he had no idea that the character would take off the way he would. I think Fist is your story's Opus. I agree. Fist is one of my favorite characters to write. And he seems to be a fan favorite as well. His story takes quite a twist in book two. Haven't read the book--congrats on getting it published and getting reviews!--but OMG KERNING. I just realized that this is the old version of the cover. It still shows up on amazon with the wider spacing of the letters in "Eye of the" The current version is a bit different. The letters are together, with is normal and I agree, more pleasing to the eye. The physical copies have the correct cover. I am sending a message to Amazon to make sure they update it. The the current version in the signature. Is that better? You may notice the title change. In order to avoid any confusion with the Might and Magic series of video games, we went with an alternate title. 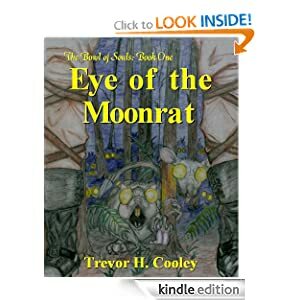 Since I am big into "Lucasing", I changed the original cover for Eye of the Moonrat in both Kindle and print editions. I had some complaints that the original lettering was too "1990's", so I matched it more to the style of the lettering on book two. What do you guys think? Better? It should be on Amazon in a day or so. Finally had some time to read the second half of book one, liked it a lot, already started on book 2. Never did find any way to update book one to the version that was uploaded after I bought it. I sent a few messages to Amazon about letting people update the old version, but they never responded. Let me know what you think of the second book. Book three will be out in a few weeks. On my "Manage Your Kindle" page under my account there's a big blue "Update available" notice next to the title. You probably need to update it there rather than on the device. Ah, yes, that's where it is. I had been looking at Amazon the page for the book or options on my Kindles. Updated both my kindles but the thumbnail image on the Fire didn't change, the book did update because the new title page is there but the thumbnail is still the old title page. Finished book 2, I liked the structure of this one more, better choices for the points where the story jumps to another plot line, so the flow of the book was better. That made it a faster read for me. Only spotted one typo (I think it was itch instead of witch). It has some better twists as well, I guessed a lot of what was going to happen but things unfolded differently than I was expecting. Overall I liked book two a little more than the first one. The characters now have me hooked, so I'll be looking forward to book three. I'm glad you liked it. I am working on the final edit of book 3 now. I'll post here when it's out on Kindle. Also, If you have the chance, please put a review up on Amazon for me! Book three: HUNT of the BANDHAM comes out Saturday on Kindle. The price of book one will go up from .99 to $2.99 at that time, so get it while you can. Thanks for the support guys!